Buy paperback @ Amazon.com NEW! 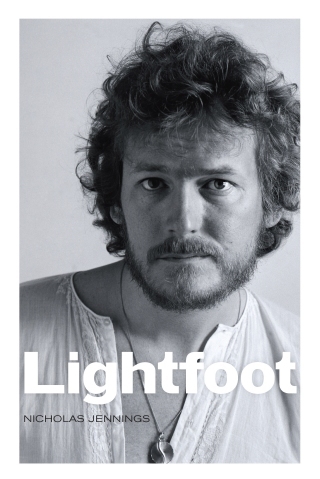 September 19, 2017 — There's no reason to keep you in suspense; the new biography "Lightfoot," by Nicholas Jennings, about the life and career of singer/songwriter Gordon Lightfoot is nothing short of fantastic. Given Jennings' credentials, that is exactly what I expected. Described as "the definitive, full-access story of the life and songs of Canada's legendary troubadour," the book is all that and more. Nicholas Jennings is uniquely qualified to write an authoritative biography of Lightfoot. He is a well-respected music historian, who has already written the definitive book on Canadian music in the 1960s when Lightfoot came on the scene. That book, "Before the Gold Rush — Flashbacks to the Dawn of the Canadian Sound" (out of print) was was the basis for the documentary, "Shakin' All Over: Canadian Pop Music in the 1960s," on DVD but possibly also out of print (read DVD description here). In addition, Jennings wrote a biography of Lightfoot for the 1999 box set Songbook, and wrote liner notes or reviews for other albums. He already knew his subject very well and had his confidence, so a full biography was the logical next step. The book was released by Penguin Random House on Tuesday, September 26th, and is in stock at Amazon US, Amazon Canada and Amazon UK. A paperback version will be released on October 30th, 2018. Buy Kindle version at Amazon.com Buy Audiobook version at Amazon.com (Check for Audible trial) Buy hardcover at Amazon.ca Buy hardcover at Amazon.co.uk. The author concentrates on the singer/songwriter's music career, as he should, but he doesn't shy away from filling in many of the blanks in the published accounts of the personal life of this highly private man. His childhood, marriages, other romances, battle with alcohol, and health issues were all covered in considerable detail, as were his entry into music, the development of his career, the people who supported him through the years, the accolades, giving back, and just about everything that figured in the story of his life. Like most of us, Lightfoot isn't proud of everything he has done throughout his life. He freely admits today that he made some serious mistakes, but he certainly isn't alone in doing that. Jennings covers Lightfoot's life from childhood to the present; the sensitive topics are handled professionally and thoughtfully, but nobody will say that he tiptoed around certain topics, nor that he missed something important to the story of this great singer/songwriter and Canadian icon. Already a chronicler of Canadian music going back to the 1960s, the author knew going in what details he needed to learn to weave a complete tapestry. In addition, he had already reviewed several Lightfoot albums, and written a short bio for the Songbook box set, so I had no doubt that he would write the long version equally well. Jennings skillfully combines his own narritive with quotes from extensive interviews with Lightfoot's family and friends, his band, other musicians and industry people, other published sources, and of course many interview sessions with Lightfoot himself. All of these sources are painstakingly documented in 20 full pages of notes, which are in addition to album information and acknowledgments. As a long-time fan and follower, I had read most of the historical articles, and written about him myself since 1998 when I launched my website. I have interviewed him, and spoken to him on many occasions since I first met him in 1999. Because of this, there were no major surprises, but there were anecdotes and details that I had not heard before. So, even for this long-time fan, there was a lot of new material to enjoy, and which provided additional insight. Probably the only thing that bothered me a bit was the account of the 1982 concert in Saratoga Springs, a concert which strongly influenced Lightfoot's decision to stop drinking, and which my husband and I attended. Jennings bases his account on a letter to the editor by a fan who was there. When my husband and I saw the letter to the editor at the time, we were aghast. Was he really at the same concert? Jennings comments that the fan whose letter to the editor he quoted had no idea what was going on in Lightfoot's life, but I did. The fan's account of what lead to Lightfoot leaving the stage in tears was negative and did not reflect the reaction of most of the rest of the crowd. In fact, what happened wasn't negative, other than that Lightfoot was clearly under the influence, but his behavior was tragic and not disgraceful. I came to the show knowing about his domestic situation (from a co-worker who knew someone close to him), and I was in the front row and understood every word he said. Because of that, I knew when I heard the instrumental introduction to the second song in the second set that he wouldn't make it through it. It was "Shadows." When we were told refunds were available, most of us didn't want that and said so. And, when he returned the following year, most of us were there again. He apologized for cutting the previous show short, and said he'd do some extra tunes to make up for it. The fans shouted back, "You don't owe us anything," and of course, "We love you Gordon." It was 15 minutes to midnight when he finally left the stage, surely one of the longest concerts he had ever performed. I hope that the fan who wrote the letter to the editor had second thoughts and returned again for that wonderful concert in 1983. I particularly enjoyed the brief mention of David Rea, who had played guitar on his first UA album, "Lightfoot" and had toured with him on and off early in his career, saying that Lightfoot always admired his intricate guitar picking (indeed), and his songwriting especially the song, "Shorty's Ghost," about a ghost that hangs out at a brothel. Lightfoot, for his part, had ghosts in his own songs, most notably the one in the wishing well, so I was not surprised that he liked David's song so much. There are two photo sections with many photos, some of which devoted fans have seen before, and some which are new, including pictures of all six of his children, all his wives and long term girlfriends and a beautiful wedding photo from his 2014 marriage to Kim Hasse. There are also photos of other members of his family, and of Lightfoot with other performers and music business people, as well as photos of the band members today and through the years. Everything is there and in a sense one can look at the photos and know what the book will say before reading it. (In fact, I looked at the photos before I started the book, and then at the chapter headings; a nice touch is that most of the chapter headings are song titles, all aptly chosen). There are few questions that are left unanswered, other than those relating to the songwriting and recording processes; perhaps this could be the subject of another book?